Chromebooks seem to be having a moment. Which is odd, because for a while there, nobody seemed to be giving them a chance. Since the first Chromebook came out, about three years ago, Chrome OS devices have gotten flak for not being able to do as much as Windows machines. And to be fair, they couldn't, especially in the beginning. Manufacturers responded by slashing prices, but that led to a whole other problem: endless netbook comparisons. Indeed, many Chromebooks until now have been small, dirt-cheap and woefully low-end. To be avoided, mostly. Lately, though, the tides have been changing. Nearly every PC maker is making a Chromebook, if not several, and many will soon be upgrading their models with heavier-duty Intel Core i3 CPUs -- processors so powerful you might actually consider a Chromebook for your next laptop. Samsung, meanwhile, is taking a different approach: It's decked out its new 11- and 13-inch Chromebook 2 laptops with a stylish faux-leather lid, similar to what it did on the high-end Galaxy Note 3 and Galaxy Note Pro. Samsung also went with a full HD screen on the 13-inch model, making it the only notebook I know that's this cheap with this nice a display. With a starting price of $320 ($400 for the 13-incher), the Chromebook 2 is on the pricey side, but then again, you're paying for better quality. So is it worth it? Chromebooks will never be for everyone, but assuming you're game, the 13-inch Samsung Chromebook 2 is the one we recommend. Its sharp display, stylish design, long battery life and comfortable keyboard make it worth the premium over competing models. 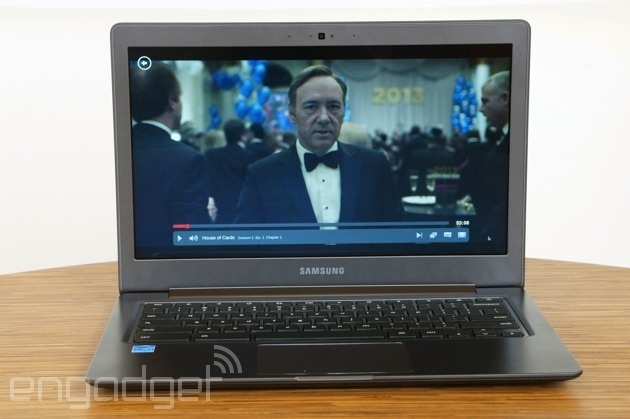 How would you rate the Chromebook 2 13-inch? It's easy to make fun of Samsung for its apparent leather fetish. I mean, if I wore pleather with everything, you'd laugh at me, too. But, as they say, don't knock it till you try it. Aside from the corny "stitches" lining the perimeter of the lid, the fake leather (available in gray only on the 13-inch model) actually gives the device a premium feel. That's partly because of the resemblance to real leather, but there's something else at work, too: The textured material does a good job masking fingerprints. Scratches, too. Even now that I've been using it a week, the machine still looks fresh. Not bad for a laptop that only costs $320. Of course, your opinion might change once you flip the machine over. Whereas the lid has been done up to look like a car seat, the bottom is made of plain gray plastic. Not that there's anything wrong with that; plenty of pricier PCs are made of this stuff. It's just that the pleather and plastic look mismatched, especially since the underside is more prone to picking up finger grease. Oh well. Not a big deal -- it's not like you have to look at the bottom that often, right? 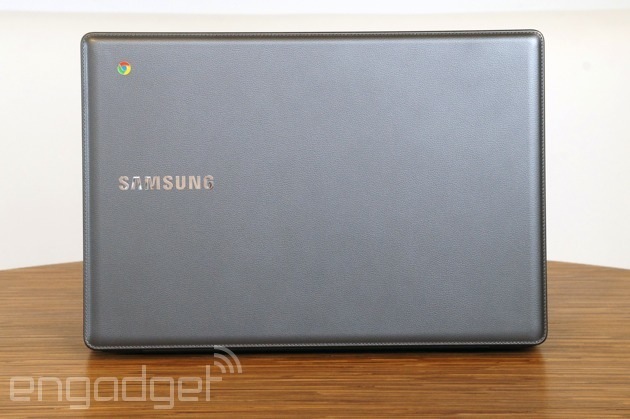 Lift the lid and the Chromebook 2 looks like other recent Samsung laptops -- save for the Chrome OS hotkeys, of course. That same gray plastic clothes the palm rest, keyboard deck and bezels, with few embellishments, except for some subtle chrome trim around the trackpad. It's not fancy, but it doesn't look cheap, either. That's the most you can ask for at this price, really. In-hand, the Chromebook 2 is about as heavy as a 13-inch Ultrabook, which is to say it weighs around three pounds (3.06, to be precise). As a bonus, it's noticeably thinner and lighter than the Toshiba CB30 Chromebook, one of the only other 13-inch Chrome OS devices available right now. That guy comes in at 3.3 pounds and 0.8 inch thick, compared with 0.65 inch for Samsung's model. Sometimes, though, the Chromebook 2 feels heavy for what it is: a laptop with a browser for an OS. 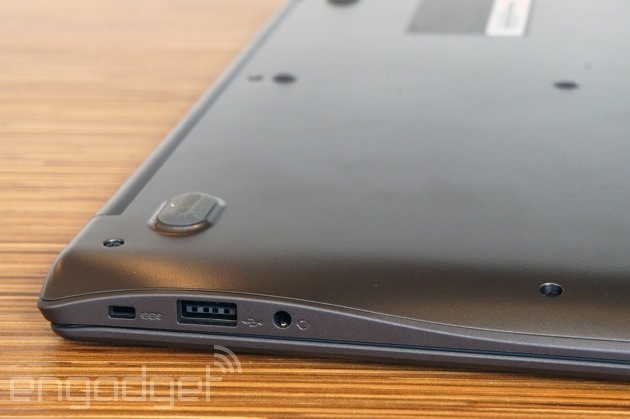 If it can't do as much as a proper Ultrabook, it probably shouldn't weigh as much, right? The thing is, that's not really a fair comparison. 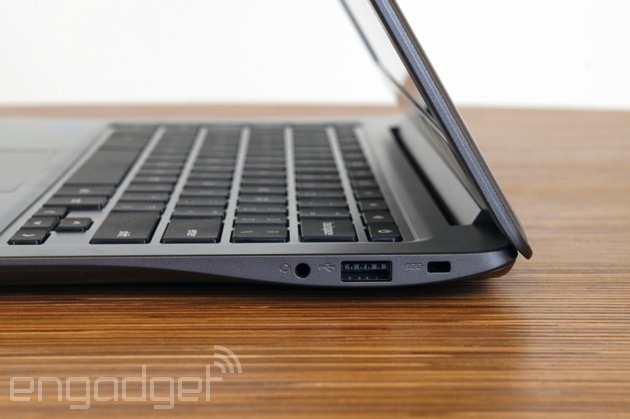 For one, 13-inch Ultrabooks cost way more. In fact, you'll be hard-pressed to find a Windows laptop at this size and this price that's this well-made (or has this nice a screen). And while a tablet would weigh less, you'd be stuck with an inferior typing experience (because let's not pretend keyboard cases are the real thing). It's all about your priorities, I suppose. That said, if you're bothered by the weight here, you should look into the 11-inch Chromebook 2; that weighs 2.65 pounds. Whichever version you get -- the 11- or 13-incher -- the selection of ports will be the same. On board, there are two USB connections (one 3.0, the other 2.0), a full-sized HDMI socket, a headphone jack, a standard lock slot and a microSD reader to complement the industry-standard 16GB of storage. Like all Chromebooks, this one comes with 100GB of Google Drive space, so perhaps local storage will be a moot point. That said, the microSD slot thing is a bit of a shame, because it means you can't insert the full-sized memory card you might be using in your standalone camera. If you've gotten used to taking shots on a phone or tablet, though, being able to swap in a microSD card could actually be a convenient setup. I've got some good news and bad news. On one hand, the Samsung Chromebook 2 has a full HD, 1,920 x 1,080 display, making it sharper than most other Chrome OS devices (not to mention my aging MacBook Air). And that's not just me reciting the spec sheet: The screen is noticeably sharper than other 13-inch laptops, especially those you're likely to find in this price range. It's great if you're streaming movies; it's great if you want to browse photos; it's great if you want to see more of your Gmail inbox on the screen at one time. Basically, it's great all the time. The problem is that while the pixel count has improved, the quality of the screen still has a ways to go. The LED panel doesn't make use of any wide-angle viewing technology, which means you'll have to fiddle with the screen position to get the white balance right. Tilt the display forward even a little and the colors will start to wash out, making on-screen text harder to read. (This can be an especially big challenge if you're typing with the machine in your lap.) Thankfully, viewing angles are a bit better from the sides, so you could, if you wanted, have a Netflix-viewing party with a couple friends. In any case, the viewing angles aren't much better on competing devices, so perhaps this is all a moot point. On a positive note, the screen is brighter than on the last-gen model: 250 nits, up from 200. As it is, the screen has a near-matte, anti-glare finish that cuts down on reflections, but you'll notice even fewer artifacts if you bump up the brightness. For me, this came in handy when I was working near a window, with lots of natural light pouring in; in situations like that, I needed all the backlight I could get. Same goes if you find yourself working outside on a patio (lucky you!). My only warning -- and this goes without saying -- is that the higher brightness setting drains the battery faster. At max brightness, for instance, the battery-life tray said I had 88 percent, or three and a half hours, left. With more moderate brightness settings, an 88 percent charge would actually mean I had nearly seven hours remaining. Yes, 13-inch Chromebooks might be heavier than their smaller counterparts, but they also have the best keyboards: well-spaced and never too cramped. And of the bunch, Samsung's might actually be best in class. The chiclet-style buttons here are well-laid-out and amply sized -- none of the major keys (Shift, Ctrl, et cetera) have been cut down. They also have a surprising amount of travel; they're cushier than the Toshiba Chromebook's, for instance. Underneath it all is a sturdy panel that holds up well against furious typing. All told, then, it's just as good as any keyboard you'd find on a more expensive laptop. And, it goes against the stereotype that Chromebooks are the new netbooks. Like most Chromebooks, this one does not have a touchscreen. That can be a shame at times, especially if you've gotten used to swiping and tapping in Windows 8. 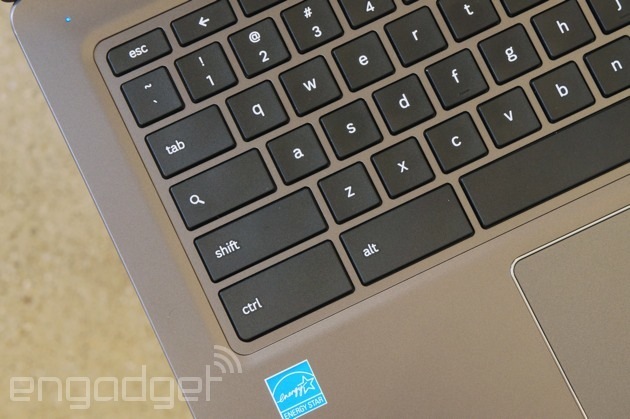 Fortunately, though, what the Chromebook 2 lacks in touch input, it makes up for with a fantastic trackpad. It's large, with plenty of space for your fingers, and it responds smoothly to multi-touch gestures, like two-finger scrolling. Single-finger navigation is also precise. 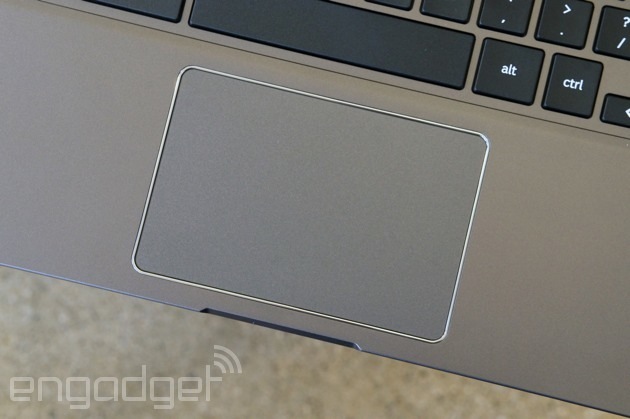 Why can't all touchpads be this fine-tuned? Chrome OS hasn't changed much since our last Chromebook review, late last year. After three years of incremental improvements, the operating system is finally in a place where you can multitask, as well as do a decent amount of work offline, without the aid of an internet connection. It helps to be able to resize, minimize and move windows, as well as pin apps to the desktop and swipe upward on the touchpad to see all open apps. Gmail and Google Drive support offline access, as do many third-party apps available in the Chrome App Store. Just remember to go through the syncing process while you still have a WiFi signal. Google's G+ Photos app works offline as well, though the editing tools are crude compared to what you'd enjoy on a full editing suite like Photoshop. You can print, too, through Google Cloud Print; keep in mind, though, that not all printers are compatible. Lastly, Chrome OS was recently updated with improved folder organization, along with support for voice commands (so long as they're in English). As limited as Chromebooks might still seem, they'll still be enough for some people, whether it be children, young'uns used to doing everything online or folks who need a lightweight, secondary laptop to use on trips. You might miss certain major apps, like Skype or iTunes, but if you can't live without those, then a Chromebook probably isn't for you; get an inexpensive Windows laptop and call it a day. I won't rule out the possibility that Core i3 Chromebooks are more powerful than the Chromebook 2; in fact, I'm sure they are. That said, I have some questions about diminishing returns: How much better will the Core i3 models be, and what impact will they have on price? Until I test my first Core i3 Chrome OS device, I unfortunately can't compare performance. Suffice to say, though, the octa-core chip inside the Chromebook 2 was pretty much always enough for me: I could open lots of tabs and jump around between them. I could stream Netflix without a hiccup. There might be a difference between a Core i3 and a mobile chip, but for some people -- many people, even -- that difference will be irrelevant. 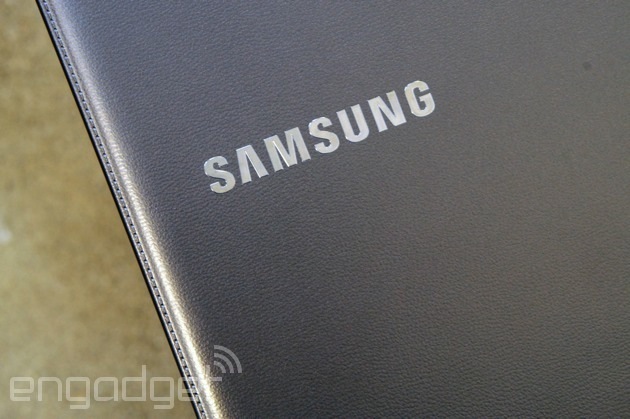 It also seems that by using an ARM-based mobile processor, Samsung was able to extract some real battery life gains. Under ideal conditions, the company promises 8.5 hours for the 13-inch model, and eight hours for the 11-incher. Even with constant video playback and the brightness set to a relatively high 10 out of 16 bars, I still managed eight hours and 22 minutes of runtime. Not bad -- not bad for a Chromebook, and not bad for a similarly priced Windows laptop, either. With the addition of the new Chromebook 2 line, Samsung now has three Chromebooks for sale: the new 11- and 13-inch models, along with the last-gen model, which also has an 11-inch screen. All in all, the two Chromebook 2 models have more in common than not. Both use the same octa-core chip, 4GB of RAM, 16GB of built-in storage and the same port selection. Both have a leather-like back, though the 11-inch version is sold in black and white, whereas the 13-inch model is only available in gray. The biggest difference -- aside from size -- is screen quality: The 11-inch version has 1,366 x 768 resolution, while the bigger one goes up to 1,920 x 1,080. Accordingly, the 11-inch one starts at $320, while the 13-inch version retails for $400. 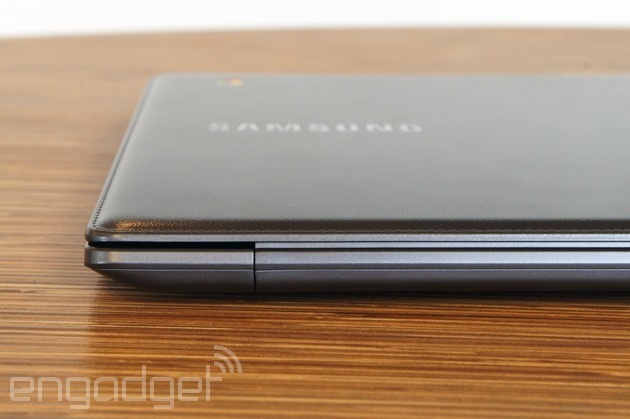 If you want to save money, you can still pick up the last-gen Samsung Chromebook for $250. Some caveats to note: It's less powerful, with a dual-core Samsung chip and half the RAM. It offers slightly less battery life (seven hours vs. eight on the new 11-inch model), with a plainer design. The screen resolution is still 1,366 x 768, with a brightness rating of 200 nits (only the 13-inch version is 250-nit). Interestingly, while the new model is, generally speaking, a modest improvement, the old edition is actually lighter: 2.43 pounds, compared with 2.65 for the new one. So it has that going for it. All told, the differences between the two 11-inch models are fairly modest; if you go for the 13-inch version, you're in for a bigger leap in quality (sharper screen, et cetera). Truth be told, you're unlikely to find a better Chromebook than the 13-inch Chromebook 2. That said, it can't hurt to weigh your options before you lay down the 400 bucks, right? As I've hinted throughout this review, the Chromebook 2's most direct competition comes from Toshiba, whose debut Chromebook also has a 13-inch screen. In its favor, Toshiba's model is a hundred dollars cheaper, and promises up to nine hours of battery life, but its screen (also non-touch) has a lower resolution of 1,366 x 768. The machine itself is thicker and heavier, with a plain, if inoffensive design. I can tell you from my personal experience, too, that although the keyboard is decent, it's flatter and slightly more cramped than Samsung's. The touchpad isn't as reliable, either. You might still consider this on account of the price, but as they say, you get what you pay for. Indulge me for a moment, because I want to slide even further down the quality scale. Toward the bottom is the Acer C720, which starts at just $200, or $300 with a touch screen. That's right, touch is an option here -- something I can't say about many of the other brands I've listed. And even with touch, the price is pretty fair. Just keep in mind that Acer cut many a corner to get the cost down. In particular, the keyboard is about as cramped and flimsy as a netbook's. And I should know: I've been living with the C720P as my main home computer for several weeks now. Hewlett-Packard, meanwhile, has two Chromebooks on offer: an 11-inch model ($279) and a bigger 14-inch one for $299. It's worth noting that the 14-incher is an improved, more powerful version of the original 14-inch Chromebook HP came out with, so we encourage you to disregard the low score we gave that earlier model. Even so, the Chromebook 14 is still one of the biggest Chromebooks, meaning it's going to be bulkier and heavier than almost anything out there. Also, though you get more screen real estate, you don't actually get more pixels; the resolution tops out at 1,366 x 768. Meanwhile, Dell's Chromebook 11 goes for $279 and up. Over in our product database, it has an aggregated score of 78, which means reviewers around the internet generally like it, even if it's not their favorite. Lastly, Lenovo and ASUS have both recently announced some new Chromebooks, but none of them are out yet. You could always wait around, though it seems you already have lots of options, with Samsung's Chromebook 2 arguably being the best. Chromebooks still aren't for everyone: There will always be people who need stronger performance. Who need full offline access. Who need to install Skype. If that's you, no Chromebook will do, even if it is wrapped in fake leather. For a certain kind of customer, though -- schools, students on a budget, a traveler in need of a lighter laptop -- Chrome OS could be compelling. Those people need a sturdy keyboard for typing, but can get by doing almost everything online. 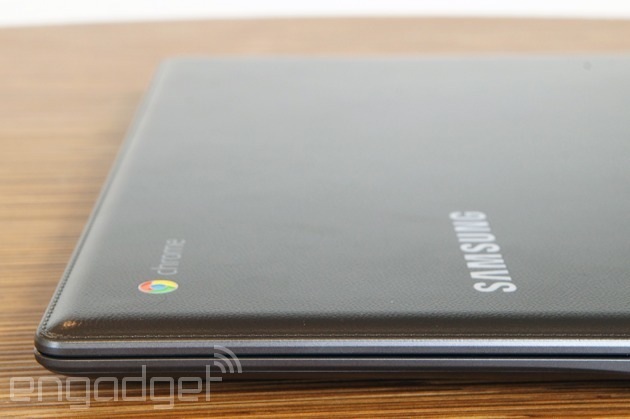 If that's you, I would recommend the Samsung Chromebook 2 over everything else in its class. Yes, it's pricier than its rivals, but for the money you get a sharp screen, a premium-looking design, long battery life and a keyboard-trackpad combo so good even "regular" PC makers should take note. At $400, it doesn't feel like a netbook; it feels like a proper laptop. And I dare say, it's nicer than any Windows notebook you'll find at this price. Keep that in mind the next time you're perusing the budget shelf at Best Buy.